Winterhalter are long established as a market leader in commercial ware washing systems. They manufacture nothing but dish and glass washing machines, and as such, have developed cutting edge system technology. The GS502 is testament to this reputation. Probably the most efficient and hardest working pass through dish wash, it offers fantastic reliability, thoroughness and cost efficiency. 3 Phase power and a 3/4″ cold water supply are required. 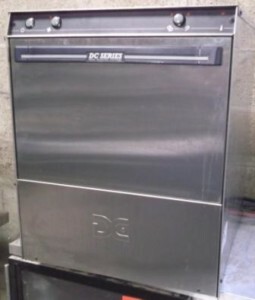 For an opportunity to own a coveted Winterhalter dishwasher with significant savings compared to new, call our friendly and helpful team today on 01733 714 265 for more information. If you’re looking for a Winterhalter dishwasher, then firstly, congratulations on making an excellent decision! This is an important thing to ask, as buying catering equipment can be an expensive business, so you need to make sure that you purchase from the correct supplier. At Caterquip, many hundreds of discerning catering businesses of all sizes have decided that we’re the correct supplier for them. 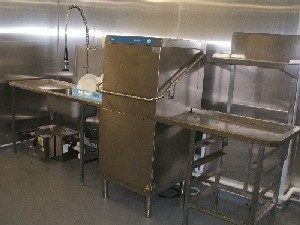 Over the course of our 20+ years in business, we’ve grown to become the largest supplier of second-hand, reconditioned and used catering equipment in the UK. A huge part of our success so far has been due to our dedication to ensuring that our customers have a great experience before, during and after their purchase. We go the extra mile to delight our clients, providing excellent products, service and support. This means that we produce a great deal of satisfied customers, year after year, and this is one way our business has grown over time, through repeat customers and positive word of mouth. We’ve worked very, very hard over the years to build up our good name in the catering industry, and we’re determined to maintain it. This means you can have peace of mind when you purchase from us that we’ll want to make sure you’re happy with your order! Before we even think of putting any of our stock up for sale, we’ll get our specialist catering technicians to look at it all very thoroughly, from top to bottom, casting a critical eye and identifying exactly which parts are working perfectly, and which bits could do with being replaced. If anything needs doing, we’ll then request the correct parts direct from the equipment manufacturer, and our trained mechanics will carry out the repair and maintenance work to the highest professional standard. We stand by everything we sell, which is why we offer at least a three month warranty on all our products. It is this dedication to selling top-quality goods, and only top-quality goods, in combination with our ability to sell products for up to 60% off the usual retail prices, that we believe is a crucial part of our success as a company.